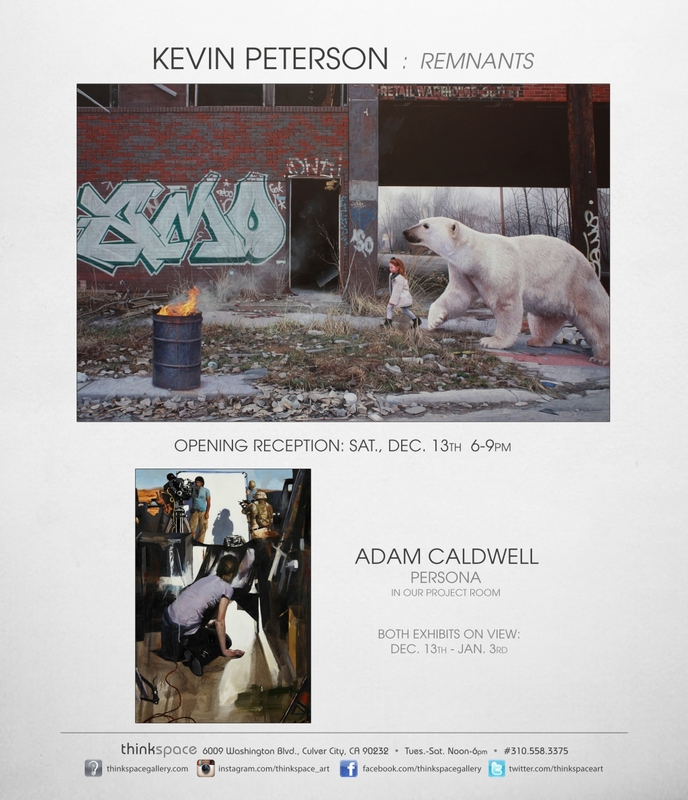 Concurrently on view in the Thinkspace project room is Persona, featuring new works by San Francisco based artist Adam Caldwell. A technically impressive painter who has mastered a multiplicity of styles, Caldwell constructs his narrative works as one might a theatrical collage, juxtaposing disparate elements to create beautifully disjunctive and thought provoking mise-en-scènes. With an interest in art historical precedents, philosophy, and contemporary culture, Caldwell creates intelligent, historically ambiguous works that examine themes such as political conflict, gender and identity. 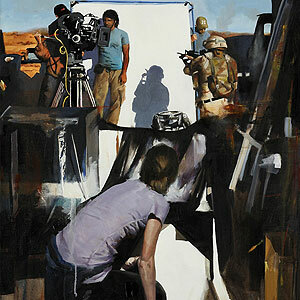 Combining painterly gesture with hyperrealistic elements, his surfaces are dense and rich with contrast. Expressionist moments are drawn against the graphic, and figurative detail is set against atmospheric expanses. Caldwell has an attentive hand for the detailed imperative of portraiture. The artist is drawn to the intimate depiction of subjectivity, rendering tenebrous portraits that seep intensity, and at times, emotive discomfort. His darkly portraits are arresting glimpses into the possibility of multiple symbolic “selves”; frames unto an endless array of human masks and roles.